This week’s close up’s going to take a look at Brixton Windmill. Many people are unaware that this very urban, cool part of London is actually home to rather a magnificent windmill. As it goes, up until the middle of the 19th century, Brixton was pretty undeveloped and had more in common with the green hills of Surrey than with the UK capital’s urban sprawl - hard to imagine isn’t it? The windmill was built in 1816 by John Muggeridge and Sons, family builders. It was leased to Ashby family the next year. At the start of the 19th century a merchant from Southwark bought about 62 acres close to Brixton Hill. He gradually sold it off and then the Windmill was built in 1816 by John Muggeridge and Sons, family builders. A year later, John Ashby of Brixton Hill obtained a 99 year lease for two acres of land to the south of a new road, alongside a brick corn mill. The family were millers producing stoneground wholemeal flour. The mill henceforth became known as Ashby’s Mill for the whole of its working life. The family’s lease on the watermill ran out in 1902. 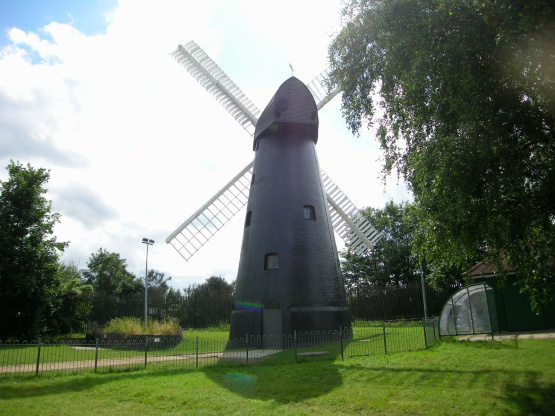 Joshua-John Ashby went about successfully returning milling business to Brixton and installed new machinery in the old windmill. Ashby, the last miller died in 1934 and the mill ceased production and became rundown. In 1957, the London County Council (LCC) purchased the land and associated buildings. They decided to turn the land into public open space called Windmill Gardens and destroyed all of the outbuildings. Seven years later, the windmill was restored and opened in 1968 at Easter. For several years after this, the mill opened each weekend during the summer. From the mid seventies, the windmill fell into a period of restoration and refurbishment. After that, there was a period of vandalism and neglect. It closed in 1990. Now a look at recent history: in 2002 the windmill was placed on English Heritage’s Buildings at Risk register. The following year, several local residents formed the ‘Friends of Windmill Gardens’ group and started campaigning for it to be restored. Awarded a grant seven years later, the Heritage Lottery Fund awarded a grant to the FoWG/Lambeth Council partnership and the restoration of the windmill got underway. Work began in October of that year and took a few months to complete. The mill was converted to electrical power and many parts of it restored. It was reopened to the public in May 2011. Volunteers open the mills regularly for guided tours and have education programmes for local school children. Brixton Windmill are only open from the month of April - October. Please see website for more details. Interested in buying in the area? Check out our properties for sale in Brixton. Thinking about selling? Get a free valuationfrom our friendly team today.